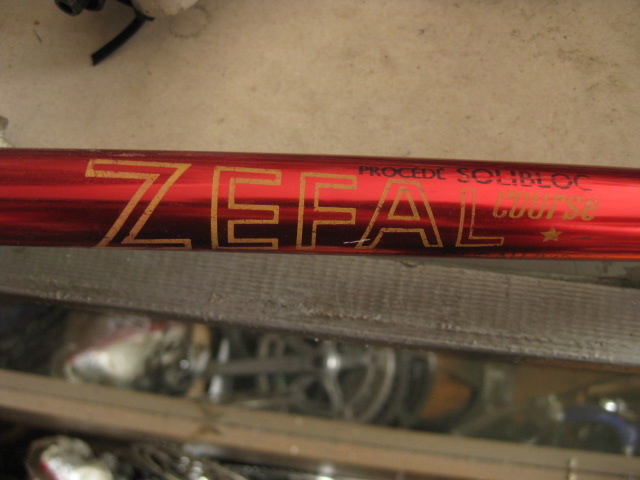 Zefal Course pump from the 1950s-1960s. This is one of my favorite pump logos, and with the red annodization, it is more unique. 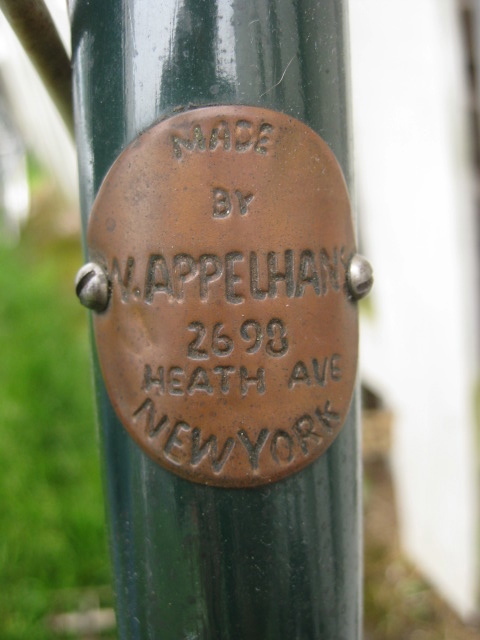 Willy Appelhans, an accomplished professional racer from Germany that came to the United States to race 6 day races and later built some of the best bicycles of that era. 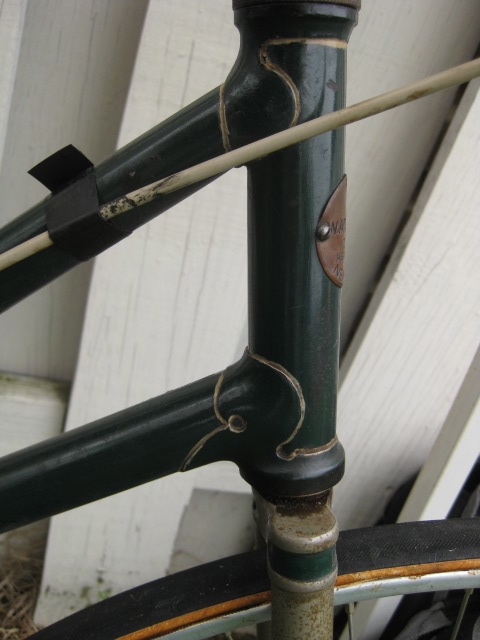 Left chain stay has a reinforced sleeve, I assume for a coaster brake arm. 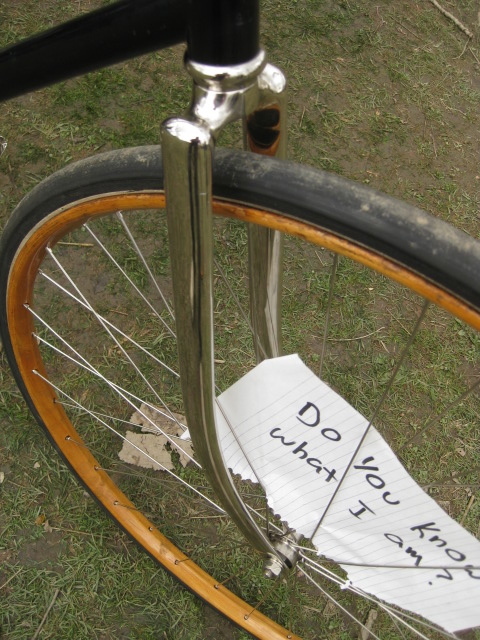 This bicycle was shown at the Copake swap meet with a sign on it asking "Do you know what I am?" I didn't know, along with a lot of other fellow collectors there but maybe someone on the internet can look at the clues and figure it out. 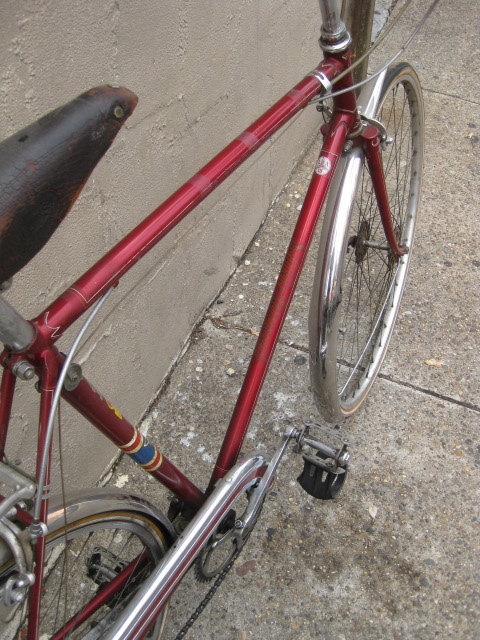 It has been beautifully restored, with the nickle plating shining through all the rusty old bikes at Copake. 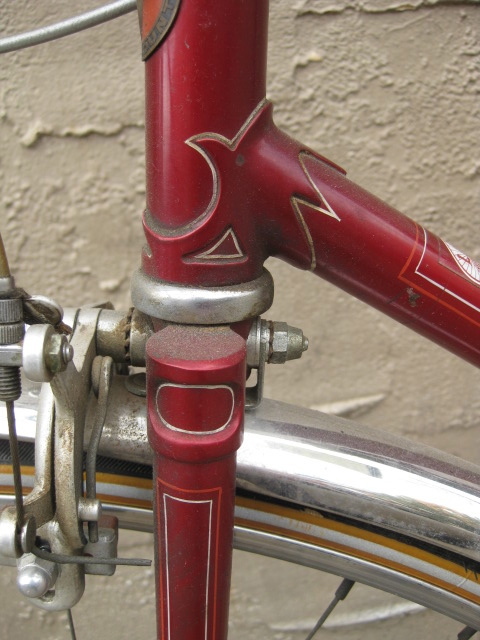 Interesting fork crown, sure to be an identifying clue. Elegant 3 piece or perhaps 2 piece cranks, I forgot to look closer. 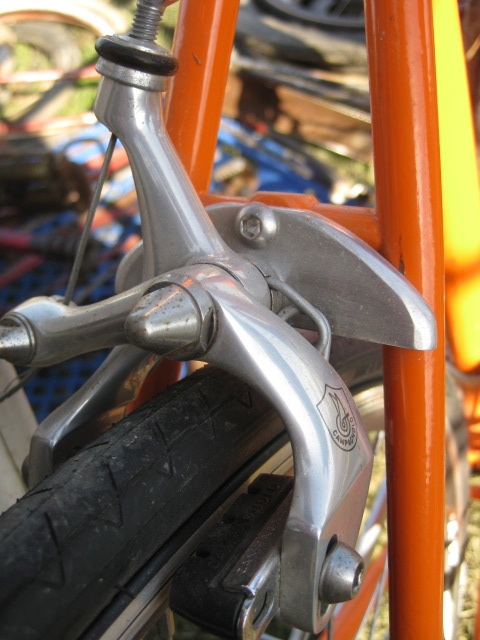 It is a nice example of early cotterless crank arms, a lot of collectors associate the advent of 3 piece crank assembles(right and left cotterless crank arm and a bottom bracket bearing unit) with racing bicycles in the 1960s, Campagnolo's name coming to the forefront. They were invented in the late 1890s and used sparingly. I should do the patent research to find exactly who was the first manufacturer/inventor. 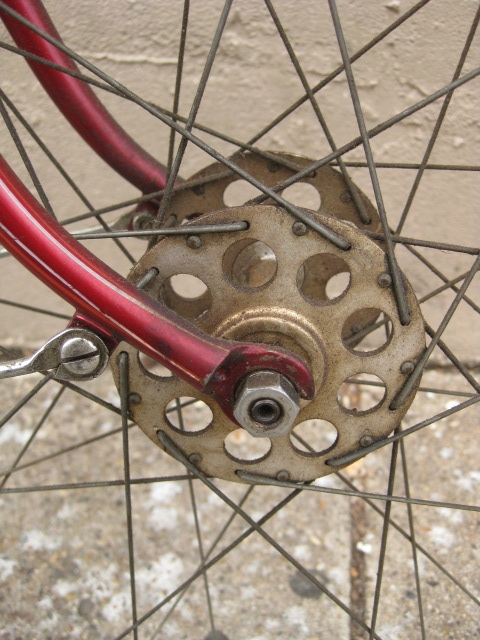 In the 1930s, CCM, a Canadian company, manufactured a cotterless steel crank set with a triangle taper. 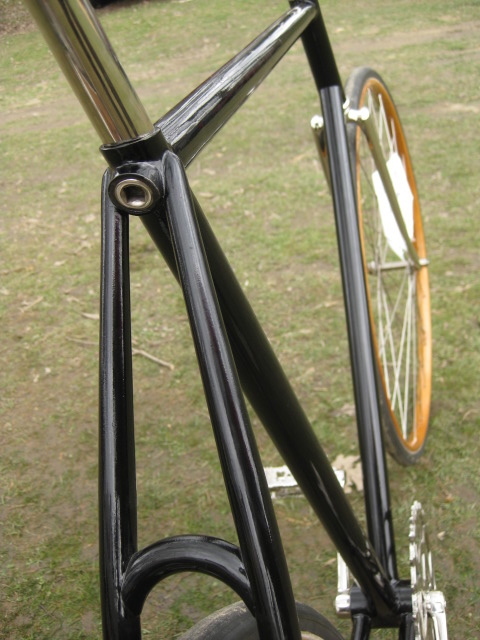 In 1934 Stronglight introduced their square taper crankset that would later be known as the Model 49. It was available in both steel and aluminum versions. Interesting rear dropouts, I wish I took a better photograph of them as it does not seem to offer much adjustment for the rear hub, to control the tension of the chain. Maybe it works like an eccentric? New Departure track hub with modern DT stainless steel spokes. 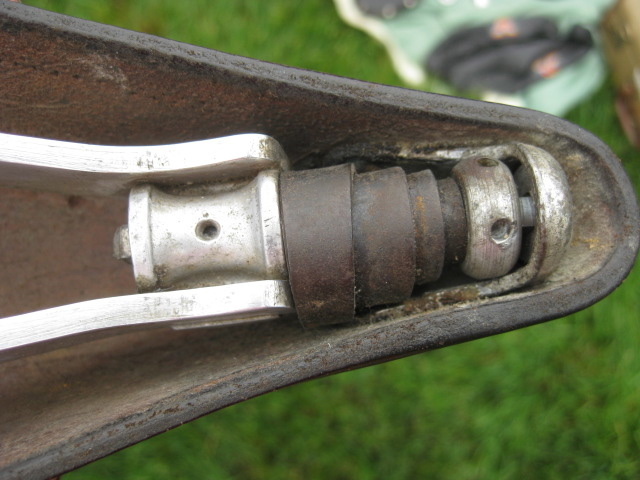 I don't think I have ever seen that seat cluster bolt before. I have seen similar, but not one as large and as elegantly done. 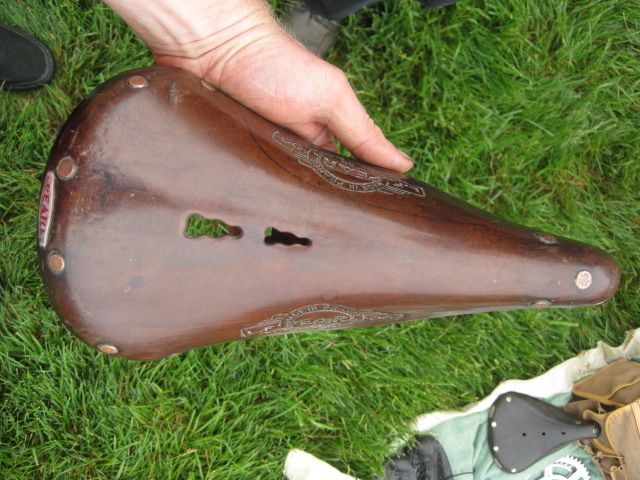 Very nice arched seat stay bridge. 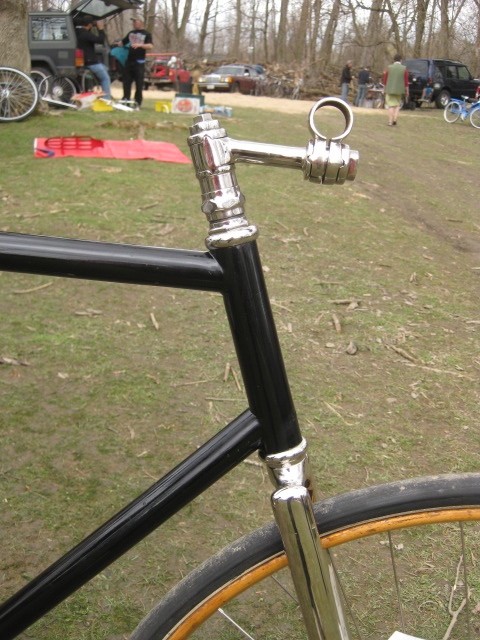 Adjustable stem, so the handlebars can be mounted 'below' the stem for racing and 'above' the stem for more casual riding. I recently saw this well machined drop plate on a mid 1980s Trek road bike. 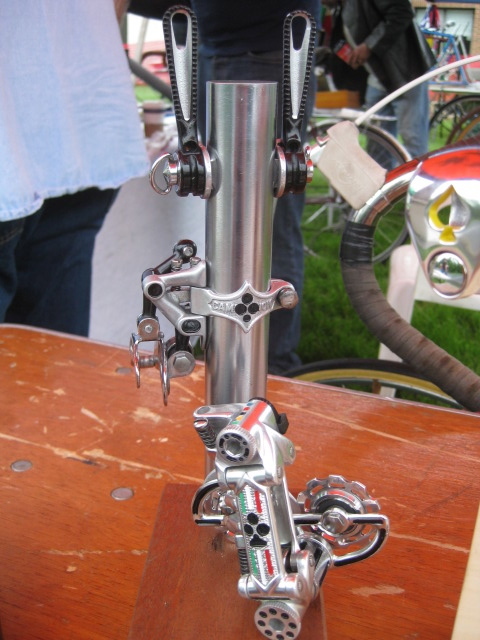 I have seen my share of drop bolts- from one by Campagnolo and Dia Compe to a few home made, dubious looking setups. 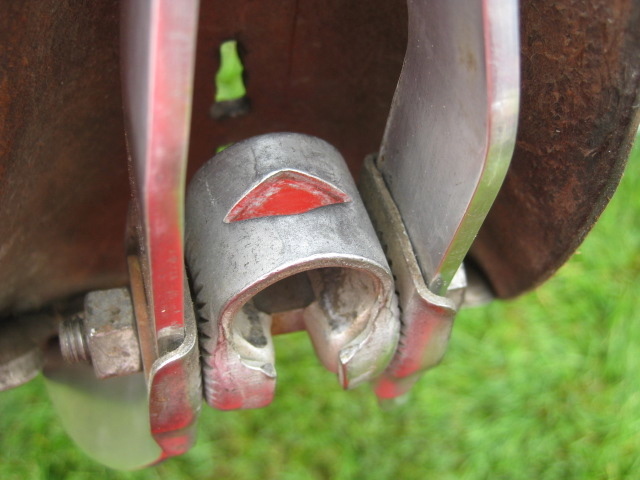 This solution to needing to lower where the brake mounts because of the caliper reach is too short is one of my favorites. It appears to be rigid and well supported. Anyone know anything about the manufacturer? 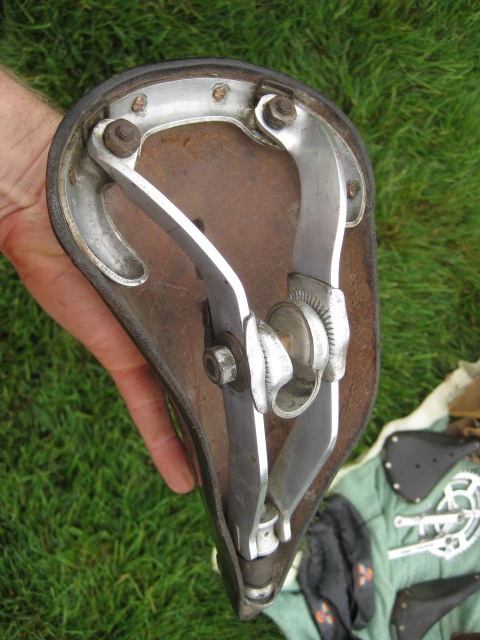 The copper rivets are stamped "Pearl", a nice touch that Ideale later added to some of their saddles. Milk crate full of hubs. Harden bacon slicers, airlites, campagnolo track. . .
Miscellaneous items from sale by Dale Brown, Classic Rendezvous founder. 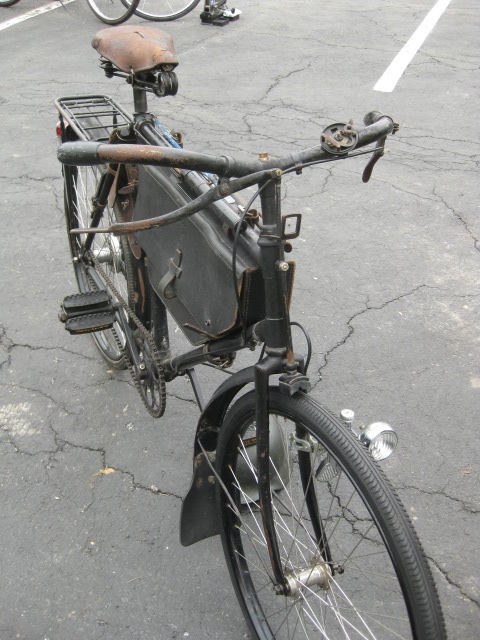 A Willy Appelhans bike. More pictures in a couple days, this is just a teaser of his headbadge- one of my favorite headbadges of all time. 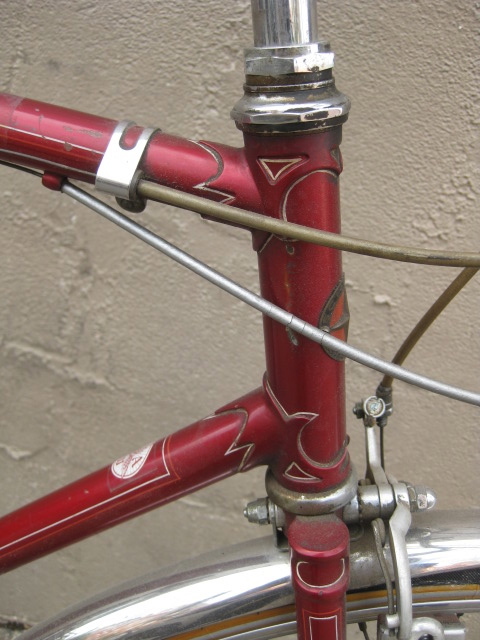 Front end of a Colnago. JRA- just riding along. Australian built and over the top paint work on this Speedwell. 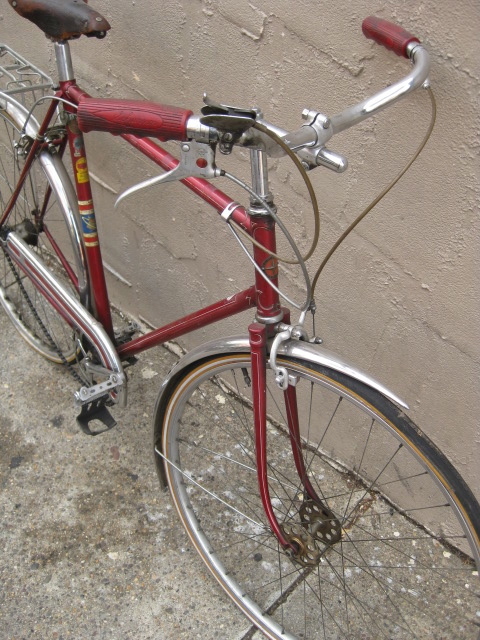 Nice Italian city bike with integrated handlebars/stem/brake levers. In Leesburg,VA. just a 3 hour drive from Philly. We are selling a bunch of stuff tomorrow(sunday May 19th) there at the annual swap meet. $5, $10, $20 boxes of small vintage parts and essentials. All the little pieces you misplaced over the years- tools, brake parts, derailleurs, cable guides, etc. 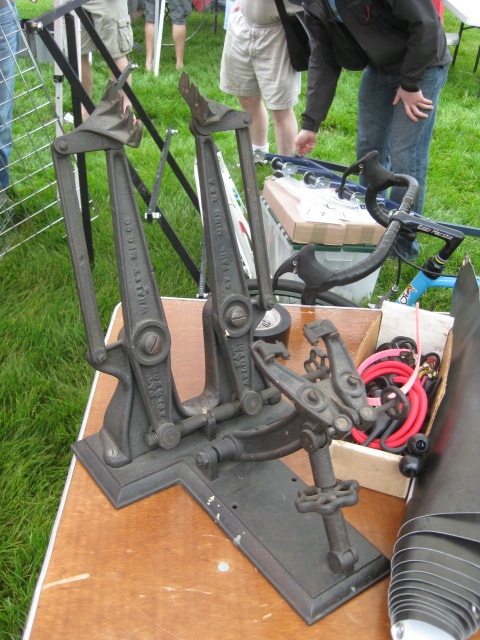 And we will have some nice components to sell too, at discounted prices to make room for more stuff. 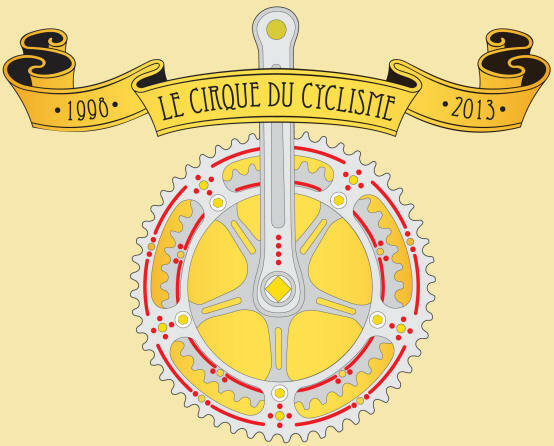 There is also a bike show there, with a lot of storied bikes and builders from the Classic Rendezvous list.Oh yeah, and also the people, meet people. . . .as the kids would say -IRL- In Real Life! We recently had Schwinn Paramount dropout adjusters machined and cadmium plated, a faithful reproduction of original ones found on Paramount track bikes from the late 1930s-late1950s. 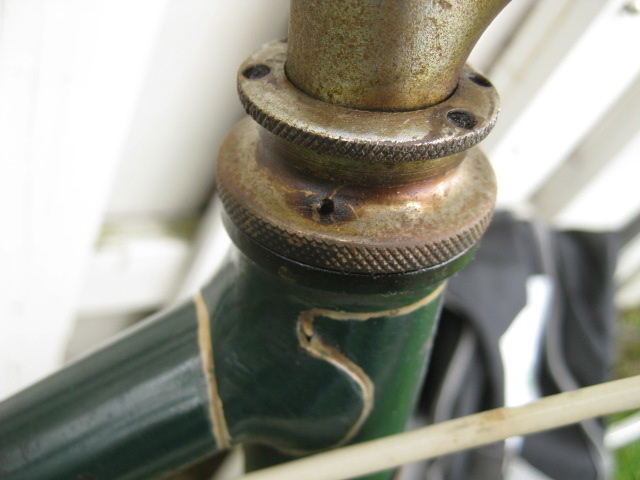 Schwinn originally copied the design from quality British made adjusters, so they are interchangable with BSA, Chater Lea, and other British hubs of the time. They are $100 a set. 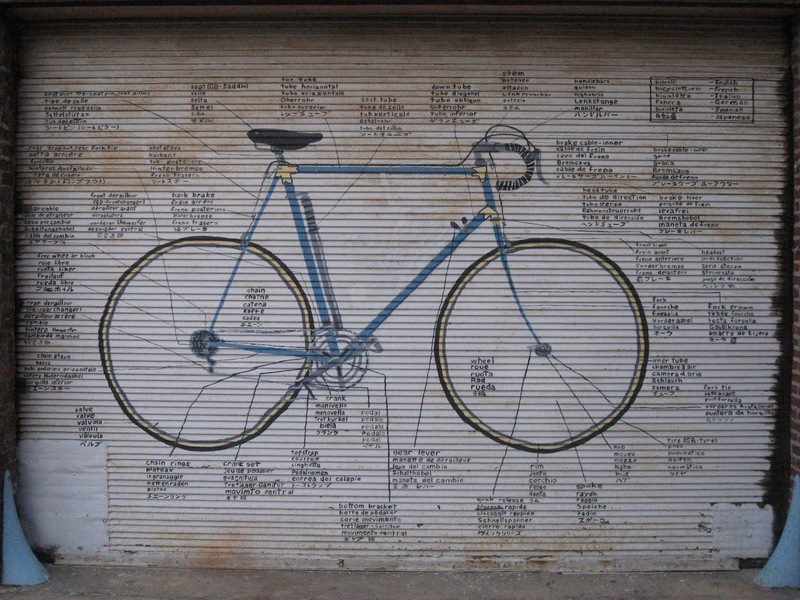 Recently stumbled across this image of our garage door at the shop and realized I never took a picture of it. it was painted by a local art student, and is based on the illustration in the Sutherland's Repair Manual. Unrestored as found. 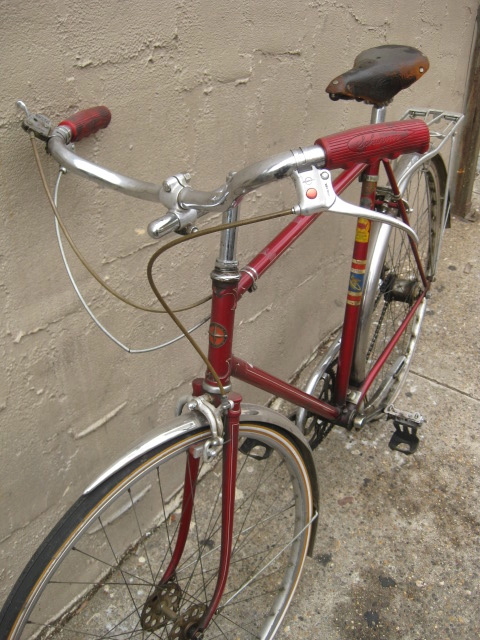 Late 1950s Schwinn Paramount tourist. 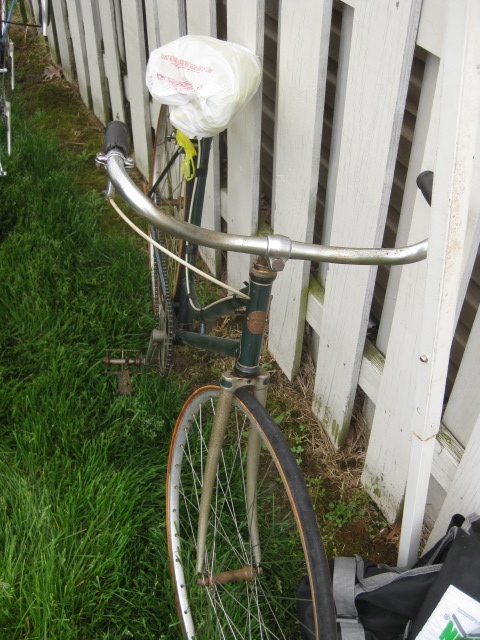 *Schwinn Paramount stem, cranks, bottom bracket, headset, and front hub. 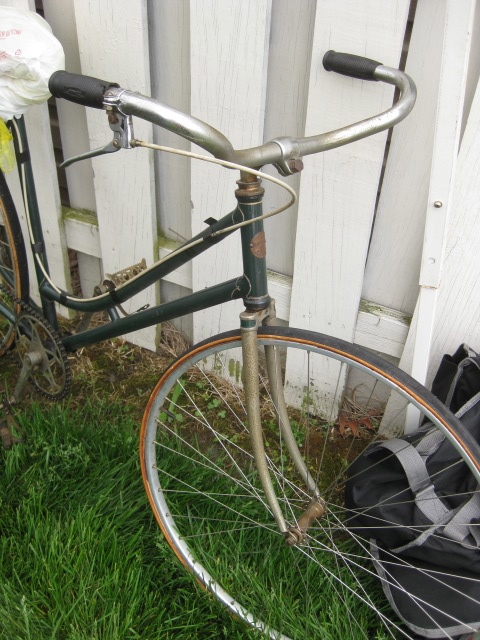 *Weinmann brakes and 27" clincher rims.